Tone muscle and cultivate self love with this Yoga Flow! A Valentines Vinyasa! A pick me up if you are feeling blah. A work out. A love note. A fierce yoga practice to remind you that you are awesome and that you deserve to Find What Feels Good. Make time and take time for you. Self care in the form of smiling, stretching, strengthening, softening and breathing – deep. Open your heart, cultivate strength, tend to the neck and shoulders and tone the lower body. 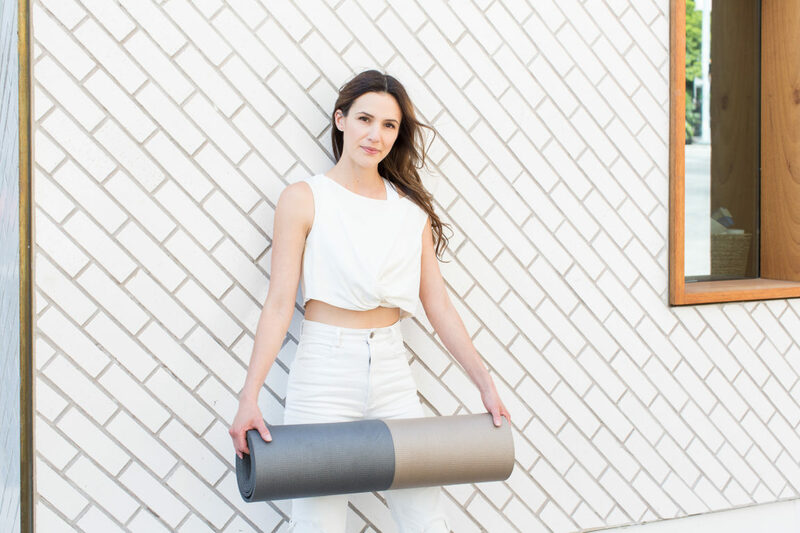 Hop on the mat, connect and accept where you are today by simply showing up. Open your mind as you open your heart today’s practice. A great post Yoga Camp video! When my mom was dying I sang her favorite hymn to her. It was “In the Garden”. That is what I thought of at the end of this practice. I haven’t thought of that in a long time. Lovery your videos, I’ve been doing them for a couple months. Well tonight I did your Valentine’s one but did it before my 4 year old daughter was in bed, she ended up following along with me and she loved it, but it was difficult for her. I was wondering if you have posted like a mommy and me video, or, if you have a recommendation of one you’ve already done that would be easy for her to follow along. I love, love, love, your videos!! I’m still a newbie at yoga ,but I find your foundations of yoga super helpful. I actually found your videos because I was searching for something to help with lower back pain. Since I am new to yoga, I’ve been doing some reading on it and I found conflicting recommendations for doing poses like downward facing dog when your menstruating. What are your thoughts on this? Thank you so much for all things yoga. I love these videos . My favorite love song is ‘the no seatbelt song’ by brand new. Where did you get that yoga pants? It looks lovely!! Thank you so much for this self-love practice today, it was the exact thing I needed that I didn’t realize I needed (if that makes sense). Over the past few months I’ve struggled with loving myself and hearing you say that I have all the love I need inside myself literally made me cry on my yoga mat. I feel like I’m finally getting to a place where I know that all I need is myself. Thank you. Adrienne where do you get your high cut sports bras!!!!??? I need some! You used to have a donation button in the website but now I can’t find it. I’ve gotten more out of your free videos then any exercise I’ve ever done and would like to make a donation. How do I this? Favorite love song by Lionel Ritchie, “Hello”…. I want to say a warm thank you to you. I have a chronic disease and I am a lot at home at this time. It is difficult to keep doing my practice but you help me to come on the mat each day. It is a pleasure to see how somebody is so motivated to spread yoga all over the world. May you have a nice valentine today and for the rest of your live lots of love around and in yourself. Always and Forever. Took the day off from Yoga Camp to do this practice and loved it. Happy Valentine’s Day Adriene and Benji! Favorite love song – “I Will Always Love You” by Whitney Houston. Great Valentine’s Day yoga flow! I love your theme of self-love and connecting the mind with the body. I just finished Yoga Camp and absolutely loved it! I really feel like focusing on affirmations and cultivating self-love along with strength makes your yoga practice so unique and helpful. Love and affection – Joan Armatrading. Thank you Adriene, you are simply the best! Love is all you need by the Beatles. Thanks for this awesome love practice. Saving this one up to break in my new mat which will hopefully arrive tomorrow. Can’t wait! One of my favorites: “Your Song” by Elton John. Happy Valentine’s Day dear kula!! Love love love to every sentient being! Damien Rice: i don’t want to change you. Just saw her last night. She was talking about the importance of getting involved in what is going on around you and participating in life. It kinda of goes along with what you wrote. May you have a heavenly day and may it radiate out from you and into the world around you and the whole world. My favourite love song is Higher Love – Steve Winwood, (James Vincent McMorrow also does an amazing cover). Beautiful and totally uplifting and heartwarming! Favorite love song. I have so many. I’ve been listening to Survivor, I Can’t Hold Back and High On You. Journey’s faithfully, Bon Jovi, Volbeat’s Lola Montez. That’s just a few. Many more that I enjoy. Love to you Ms. Adrienne on this Valentines Day! Happy St.Valentines day from Amsterdam, the Netherlands! Last time did yoga like 2 weeks ago and felt very good, but today my body was not that fit 🙁 But very happy to walk through it !! My favourite love songs are always from Sade. Any of it! Peace and love to all everyday! You continue to share with the world your beautiful, gentle and nurturing yoga. Thank you for this 🙂 A beautiful love song that springs straight to my mind is Quiet Nights of Quiet Stars performed by wonderful Sarah Vaughn. “The Book of Love” by the Magnetic Fields. Or Peter Gabriel’s cover. Both really wonderful, but really different. Happy Valentine’s Day Adriene and Benji. Love your videos! They have really inspired me to take care of myself which helps me to take care of the ones I love. Much gratitude, Namaste! Favorite love song is “Stay Forever” by WEEN! Adriene you are amazing and thank you for everything you do, and for always putting a smile on my face. You have no idea how much it is truly appreciated. Sending much love your way! I love the song “Gabriel” by Lamb. It’s not about love love but Love, I think like unconditional love (it refers to an angel but it can be anyone you love I think). The song that comes mind is “Endless Love” sung by Lionel Ritchie and Diana Ross. I was in elementary school at the time when it came out but I always loved that song even though it is corny. My favorite love song is “1, 2, 3, 4” by Plain White T’s. Enjoy & thanks for this fabulous LOVE yoga practice! My favorite love song is Iron and Wine’s version of Such Great Heights…walked down the aisle to it 10 years ago! I don’t have a favorite love song. Loved this yoga session! Thank you! This really helped me during V Day. Fav song – Moon River especially from Breakfast at Tiffany’s. 🙂 Thank you so much. Forgive the long comment but I have to share some love here- I have done pretty much all of your videos, and I’ve just finished Yoga Camp, which in short changed my life. I’ve been healing a very broken and beaten up heart since September and your videos have genuinely kept me going, when I really thought I was going to fall apart. Knowing I could come to the mat at heal myself little by little, breath by breath, day by day; being made to laugh by your little jokes when I dramatically thought I would never laugh again, has meant I have found not only my old self again, but my new self. I have been actively teaching myself to LOVE myself and treat myself like I would my best friend, and to find Yoga Camp was teaching what I was looking into personally was like, OH HELLO Laws of Attraction, you are listening! ANYWAY, I feel like a new, bendier, grounded, loving me, and more of that is down to your videos than I can tell you. But this video popped into my inbox as I’m actively avoiding the most romantic day of the year, and while doing it it felt like something in me just released, like I have finally let go of all that pain and surrendered myself to my future which can be and WILL be amazing. And OH SO LOVING!!! We will make self love cool again, and taking a little time for yourself can actually work wonders. I’m proof of that. I will be returning to this video whenever I need to check myself in the self love department. Thank you Adriene, you rock my freakin’ world! All the love, Phoebe, London. I’m Yours – by Jason Mraz. Sang that repeatedly to myself while walking out the pain of divorce. THANKS for your fun inspiration!!! Favorite love song . Unchained Melody. We have been married 43 years and this has always been our song. Feeling the love on my mat and off. Thanks for being you and making yoga a fun, enriching, enlightening and experience. Nobody croons like Chet Baker. “You Are Love” by Tom Paxton. Favorite love song “YOU ARE THE LOVE OF MY LIFE” by Roberta Flack and George Benson. Married him and still loving him 25 years later. I love your tapes and I love your letters…. and most of all I love YOU!! You make my day, every day. I started Yoga back in 1971 when Yoga was not so popular. I was so happy I was limber and easily did the stretches……… now, however, at age 70 coming around the corner, I am no longer that limber girl. I have been diagnosed with early Alzheimers, short term memory loss, and my height went down 3 inches from having scoliosis of the spine!!!! But ya know what? I am so glad I found you! I can do my yoga at home, not worry about trying to keep up or REMEMBER the workout!! And I constantly tell myself that I am good, I am thankful, I am loved. You are not only a yoga instructor, you are my mentor. You make me laugh, you energize me, guide me, and I am grateful. God bless you. Just finished yoga for love and it was fantastic. I shared on here earlier that I am 70 years YOUNG and can’t believe where I have taken this body through your videos! For those of us who are relatively new, can you please tell us who Chris is? Is he the videographer? By the way, Go ahead and sing…..it is very endearing! Needed that yoga sesh! Thanks! Favourite love song “Happy Together” by the Turtles. Not too sappy, I know, but I’ve loved it forever! My fav. Song is my wedding song. Falling in love Ina coffee shop. By Landon pigg. Thanks for inspiring me to get off my a##. I finished yoga camp. Felt so good to accomplish that.Trying to practice at least 4 times a week.My favorite love song is I’ll Always Love You by Taylor Dayne. Thanks for a great start to my week! My hearts melts over some old school Dave Matthews Band..like Satellite. “Thank You” by Led Zeppelin. And thank you, Adriene, for making yoga and mindfulness accessible for everyone! Favorite love song, They Love Eachother, The Grateful Dead. Thank you for a wonderful video! I just got to do the Love for Love….so empowering! Love, love, love it. The song I thought of was my wedding song by Ronan Keaton, “When You Say Nothing At All” Thank you for making Yoga a relaxing experience, I can’t believe I haven’t been doing this longer. Thank you so much for your videos! I love them all and when I’m having a stressful day or not feeling well your videos help so much! I didn’t practice much yoga for awhile but you have allowed me to really enjoy yoga again so i just wanted to say thanks. Yoga Camp was the first YOGA that I have done. I really loved it. I was surprised that I could relax as much as I did. Now I carry the mantras throughout my day!! Being an Elvis fan there are so many favorite love songs, but my all time fav is The Wonder of You, followed by Can’t Help Falling in Love with You! A little late on the Valentine’s Day wishes bot lots of love your way. You are great!!! PS I love your side jokes and singing! One of my favorites, All that really matters by Richie Sambora. Thank you Adriene for this video and for every video you’ve made. Since I found you on internet I’ve been doing yoga every day! Thanks for all the love you’re sharing! Thank you for this practice…it was just what I needed. Thank you so much for the heartfelt yoga! Your yoga is one of the best things that happened in 2015, you rock! AHH when you press your palms to the sacrum, it makes a little heart between your thumbs and fingers. <3 yoga. “When I Look in Your Eyes” from the 1967 Doctor Dolittle. Of course I was very young when I first heard it but it really stuck with me. Is there some how a way to buy and download just this video like you can with Yoga Camp? This is one of my favorites and I would love to do it when I travel 🙂 I practice everyday with YWA and it is certainly a highlight of my day. OH, my goodness, don’t know how I missed this on Valentine’s Day, but it was meant for me today! This session was beautiful. It’s 6th April and I’m in Byron Bay Australia. Breathing in with love and out with love …… Namaste. my sister found you first and recommended your videos to me. What a blessing! Your energy is just the right type of energy, and your attitude is just the right type of attitude for this practice. Thank you for sharing the gifts of your abundant soul with the world! Thank you so much for your free yoga videos! I’m recently unemployed and can’t afford to do classes as much as I would like to. I’ve been using your videos daily and it’s been a life savor. I just love your spirit, humor and Benji! I pass on your website all the time! Thank you for helping me LAUGH, slow down and take care of myself in a time I would normally feel slightly depressed. I’m truly grateful for you! My heart feels open and ready for what’s next! So yummy. This was so relaxing for my tight shoulders. Favorite love song… ‘Lucky’ Jason Mraz.